Michelle Davies | The Journal Gazette Smoke rises Wednesday after a large fire just after 7 a.m. destroyed units at U-Stor Self Storage on East Tillman Road. No injuries were reported in a fire Wednesday morning at U-Stor Self-Storage on Tillman Road, but plenty of valuables are gone. Crews arrived at 7:18 a.m. at 826 E. Tillman Road to find one of the storage buildings with heavy flames and smoke, the Fort Wayne Fire Department said. 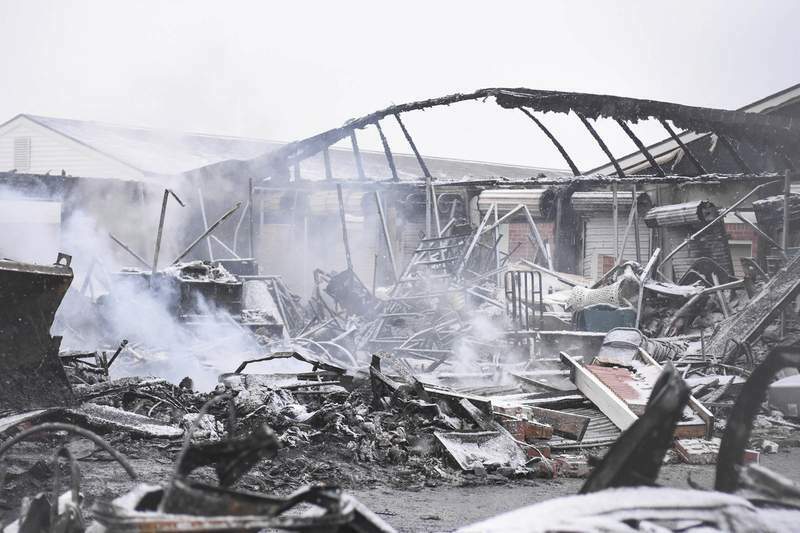 The storage units were deemed a “complete loss” by the fire department. Darah S. Watson, president of Sandlian Management in Fishers, the company that manages the site for the storage company, said the building had 20 units. Because firefighters from multiple stations responded to the scene, they were able to aggressively attack the fire to keep it from spreading to other nearby structures. However, moderate winds along with snow and ice impeded progress, the department said. Watson said she did not know what caused the fire. “We're waiting on the fire marshal,” said Watson, who believes all 20 units were being used. The company is not responsible for the items stored in the units, Watson said. “It's kind of like when you move into an apartment and you are required to insure your own items,” Watson said. Watson could not confirm that a car was stored in one of the units.